Day 4, Tuesday, May 2nd. So glad that we cancelled the Segway Tour for today. It ended up being a very rainy morning! AND it was really nice to sleep in a little. We’ve been going full on for the past 3 days! Dining reservation for Trails End at Ft. Wilderness at 10:30. We were able to sleep in until about 9am, which was wonderful! I cant tell you if the beds at Pop Century were comfortable or not – every night, I lay down and pass out – then before I know it the alarm is going off and its time to get up. I dont ‘remember’ sleeping at all. We got up at 9, and were out of the room by 9:50am. We drove over to Ft. Wilderness. Parked, and walked over to the Internal Bus. If you’ve never been to Ft. Wilderness, you should go there and check it out. It really feels like a campground out in the wilderness somewhere. It’s a big resort, thus the internal bus. The restaurant in the opposite end of the resort, near the lake. Its a nice drive over. We got to the restaurant a little early, but it was not a problem. The place was pretty empty. It’s an interesting place, it feels like some old restaurant that’s been there for years. The staff is very casual and welcoming. They seem like the all have worked together for years. Maybe they have, maybe not. We had a server named Ed. He was nice and friendly. The food was actually delicious! Just a normalish breakfast spread – but a good variety and everything tasted fresh. It was a relaxing atmosphere. The weird part was that there were literally 4 groups eating in the whole restaurant. About half way through our meal, a party of 2 is sat at this tiny table next to us – there were hundreds of 4 tops available all over. Not sure why they put them there! The hostess even made my daughter move her chair so they could put those people there. Really?? Even Ed thought it was strange, he gave the hostess a weird look! Anyway, we enjoyed this meal, and would definitely do it again. After we ate we wanted to walk over to the lake and enjoy the views. Just as we got to the lake it started to sprinkle – big drop sprinkles. Uh oh! The rain is coming!! They have a little shop right there, so we hurry inside. We decided to buy some umbrellas. We already have ponchos, but thought that umbrellas would be useful. The ladies in the store were so sweet and helpful. Turns out that one of them, Marian, use to work in Fantasyland with my daughter on Peter Pan & It’s a Small World. It was so cute to watch them as they realized who each other was! They talked for several minutes about the other cast members they worked with, and how fun it was to see each other. 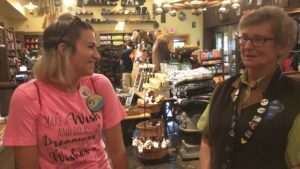 There were no other customers in the place, so they chatted for a few. My daughter was so happy to see Marian and to catch up 🙂 It sure is a Small World! As we were in the store it started to pour – buckets! Big puddles were forming all around and it had only rained for maybe 10 minutes. We opened up our fancy new umbrellas and headed to the internal bus so we could get back to the car. 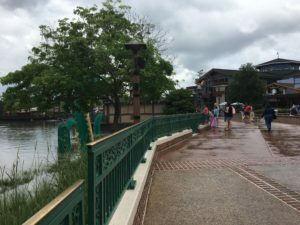 We quickly get in the car, and head over to Disney Springs. My daughter has one of her managers that she wants to go see. He works at the Welcome Center at Disney Springs. It was not a long drive over, but the roads were very wet, and there were lots of puddles! The rain is coming down hard! We made it! We parked in the Lime Garage. As we pull in we notice a weird smell. Like an electrical smell. All the car gauges look normal. It could be something in the parking garage. Or is it our car? Cant tell. After we parked, I opened the trunk to put stuff in and we notice that the trunk has leaked. Maybe that’s what the smell is – something in the carpet? It got wet and now we can smell it? I dont know. The car is running fine, so I wasn’t too worried. We moved our stuff into the car so it wouldnt get ruined – we already had a bag that got soaked. Some clothes were in there, and some snacks. I think everything is fine, just wet. Now we are off to find Kyle. Its still pouring rain! We are both wearing sandals/flip flops and its kind of hard to walk fast when the ground is wet. We didn’t really know where we were going – so we ducked into a store to look at our map. Turns out if we had walked another 10 feet we would have seen the Welcome Center. We ran over and got inside and found Kyle! I enjoyed watching them talk and catch up a bit. Kyle was one of my daughter’s managers and she really liked him! They chatted for only a couple minutes. He had work to do! 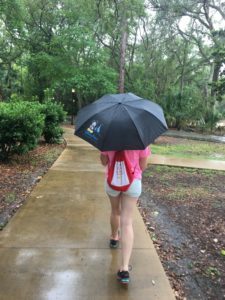 He did point us in the right direction for my daughter to go get some flip flops – the sandals she was wearing were way too slippery to walk around in the rain. Over the bridge and to the Havaianas store we go! She chose the cutest pair of flip flops!! We spent the new few hours checking out various stores. Last time we were here it was still called Downtown Disney, and there are a ton more stores now! We found the Photopass store. We decided to try to get the Dapper Day photos from Disneyland (last week) combined with our Disney World photos so we can buy them ALL with the Memory Maker. The line was slow, but we finally did get helped. 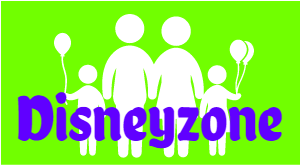 He tried to help us get the Disneyland pictures, but we found out that their system is completely separate and different from the system at Disney World. They are incompatible with each other. He pulled up the Disneyland photos and copied them on to this card, then tried to import them into the Disney World photopass account but it didn’t recognize the photos at all. Too bad! He was able to help us get all of our Disney World photos from my magic band combined with the ones from my daughters magic band. We both have each other listed in our group, but for some reason some of the photos only went to one magic band or the other. No problem, he combined them for us! Look, she is a giraffe! Now we are hungry! No reservations for the rest of the day so we can just wing it and eat where we want. We both immediately saw the Rainforest Cafe. We like that place. I know the food isn’t great but the atmosphere is fun and they have a bar, so you don’t have to wait for a table. We grabbed a seat at the bar and the server came over to get our drink orders. We decided to just get something to share to leave some room for something yummy at Animal Kingdom (thats where we are going next). We ordered and waited, and waited, and waited. She kept saying our food would be up soon – then about 30 minutes later she admitted that she never put the order in. Thanks lady! No real apology or anything, just walked away. About 5-10 minutes later our food came out. We ate! We were a little piffed that we had wasted so much time here, but the food was decent. So she brings our bill. No discount, no offered free dessert, no apology for messing up, nothing. So I left her a very tiny tip. She pretty much ignored us the whole time. The tiny tip hopefully sends a message. Directly across from where we were sitting was a huge stack of adorable stuffed seals. This one seal in the stack and I made eye contact several times during our long stay at the bar – I knew I had to rescue him! So we went over and bought ‘Lucille the Seal’. She was very grateful! She will be living with my daughter & her boyfriend. If I brought her to our house, I think the puppy would eat her! If you want to see cute pictures of our puppy, Elsie – look for her on instagram – search for Elsiesweetpea. Moving on! We found our way back to the Lime Garage, and our car. I started it up and it was still stinky. It was a mix of electrical and possibly chemical smells? 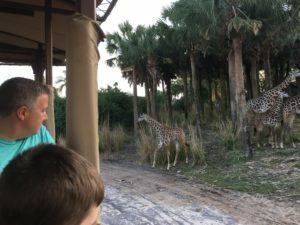 The car started up, all the gauges still looked normal – so off we went – to Animal Kingdom. The smell went with us, so its definitely our car. The trunk carpet is soaked! I cant really tell where its leaking from – almost looks like its coming in from the wheel well. Oh well, we dont need to keep stuff in the trunk. The smell was horrible, though, so we drove with the windows open so we didnt have to breathe in too much of the air – whatever the smell was from – it smelled slightly toxic. Looking back, I should have driven to the airport and gotten a different car. It was not that far of a drive. Hindisight is always 20/20..
Time for our fast pass. 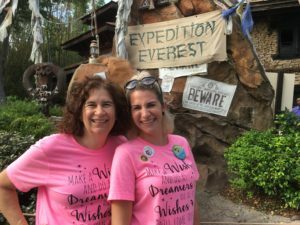 We rode Expedition Everest – since we flew through the link, we asked for the front row. You have to wait for a bit if you want the front, but really it was only 2-3 minutes. This is such a great ride! I wish we had something similar at Disneyland. Do you like our matching shirts? We got tons of comments on them. I ordered them on Etsy, from a shop called Ever After Tees. These shirts are super soft and we loved them! After we rode, we got a drink at the little stand near the ride. A Khumbu Icefall – it had guava rum, coconut and raspberry. It was delicious! Not time for our safari fast pass just yet, so we did the Maharanja Trail or whatever it was called. Lots of animals and birds to see. We took a bunch of photos, obviously. Look at all the giraffes! We were trying to time the safari to do it about 7pm, so it was not quite sunset, but late enough that the animals would be active. People suggested 7pm as the best time – so that was our plan. On our way over we saw this little stand selling mugs with an ocarina flute attached. OMG, we have to get one of those! Because it was my daughters birthday, the let her get an adult drink in the mug instead of a smoothie! Yay us! So we enjoyed the nice cool margarita! We figured out that that mug held the equivalent of 2 margaritas! We wandered over to the safari. held by his parents. But he kept staring at my daughter and she kept him amused! It was so cute. 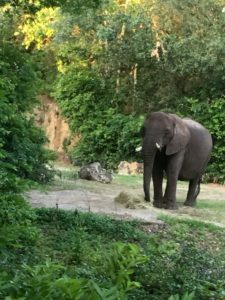 This safari was the best one I had been on – there were so many animals out and about. They were all very active, too. Tons of giraffes right next to the road. I have never seen so many giraffes on this safari. The guide told us that it looks like they were ALL out. One baby giraffe was even trying to come over to us to say HI. He drove away quickly, so the giraffe didn’t get over to us. When we got to the elephant area, even the elephants were close to the road. 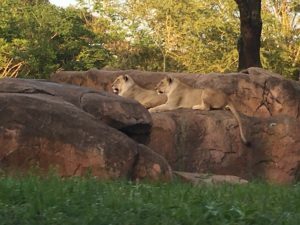 The lions were up and alert, too. The male was up on top of the rock and watching everything. I usually see him sleeping! The females were focused on the zebras right near them. I kind of think that is mean to tease them with zebras so close. Obviously if they were not fed so well, I am sure they could leap over the ravine and get to the zebras. I’ll just say that It was great to see all the animals. Definitely do a safari close to sunset. The lighting was great for photos, the animals were super active and all wandering around and awake. You will love it! 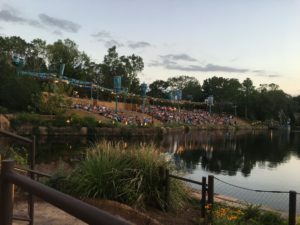 The Rivers of Light fast pass entrance is back over where we bought the ocarina flute mug. We walked back over there and wanted to see if people were in line yet. There were about 30 people already lined up! Since we had no real plans we decided to get in line. They said they’d start letting people in starting in about 15 minutes. We were let in about 10 before 8. We were free to sit anywhere we wanted, but encouraged to move as far to the left as possible for the most central view. We sat in the first row. 2 people from the left side. We had a perfect central view! The little boats came out from the canal just to the left of us! I think we had perfect seats! You can see in the photo the area across from us. I believe those people are the ones with dining reservations, and possibly another fast pass entrance, according to the cast member that I asked.She said they fill in with people who don’t have dining reservations or fast passes. To the right of us there was an area for standby guests. We had super fun people sitting next to us. The family behind us was from Kentucky and were adorable. The youngest daughter was so funny – she kept talking to us, in fact, she even came and sat with us for a while. 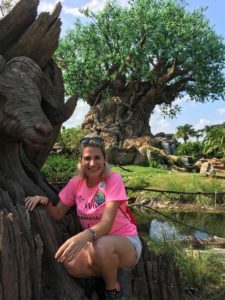 My daughter works with special needs kids and has this special connection with ALL kids – they adore her! We had to wait about an hour for the show to start, but the time went by quickly. This show is gorgeous! I am so glad we saw it. 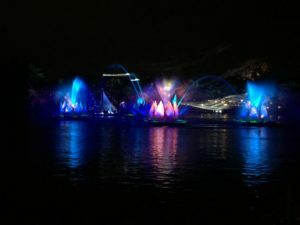 The music is pretty, the performers were great, and the effects were very pretty. We were starving by this time. The show was over about 9:30 so we were talking to our seat neighbors. The man next to me suggested that we go to Celebration. The center of town has a couple places that are open late – he recommended Celebration Town Tavern. I had driven through that little area before with my son, and loved it. So that was our plan. We walked out of the park with the millions of other visitors. The parking lot trams were lined up to pick up guests. There was quite a line of people, but we were able to get on the 2nd parking lot tram, and quickly found our car. The smell still existed, and now was concentrated inside the car. Ick! So we opened the windows and drove to Celebration. Good thing it was still warm out! The fresh air diluted the smell. It was not a long drive. Celebration is an adorable area! We found the Tavern pretty easily, and even found parking nearby. There were people in the bar, but we sat in the restaurant part. The bartender was our server. They have a small late night menu, but the items on it sounded great to us! I got a turkey sandwich and my daughter got a grilled cheese. We both gobbled down our food! This tavern had a fun feel to it, I bet its a hoppin place on the weekends. After we ate, we headed back to the hotel. We were both so tired, and a little sad that this was our last night. Tomorrow is our last day and then we head back home. This trip went by so fast! All the planning and excitement of it all .. its almost over. Wahhhh! 5 days was not long enough, but was better than nothing. Tonight we packed up and prepared to check out bright and early in the morning. Once again I dont remember my head hitting the pillow!